The self-published mini-comic is one of the best ways for creators to show off what they can do on their own, giving readers and publishers a short sample of material that also displays the creators’ independent initiative to put their work out into the world. 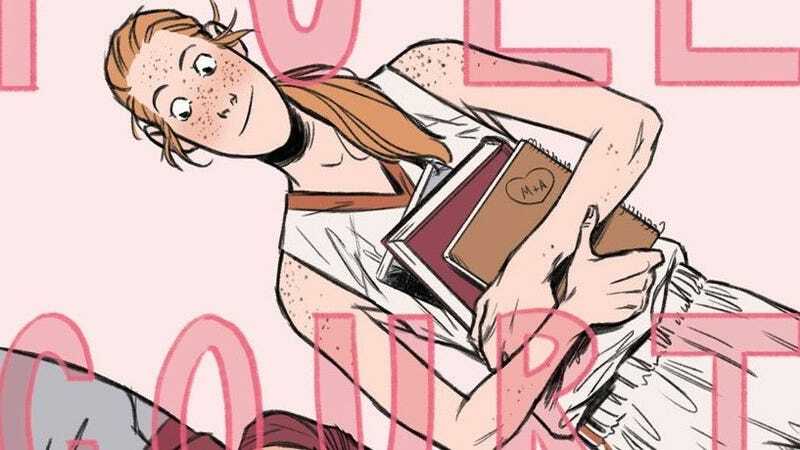 These short comics offer their own distinct challenges, but cartoonist Hannah Blumenreich has proven herself a mini-comic master, understanding how to modify her storytelling so that she’s able to fill her comics with emotion no matter the page count. 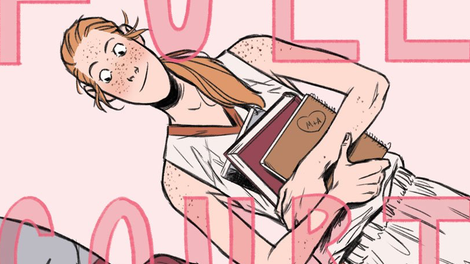 Her latest release, Full Court Crush (available for purchase on Gumroad and print preorder here), details the courtship between two high school girls in 12 pages, imbuing this relationship with sweetness, charm, and just enough conflict to makes its conclusion a victory for people from different social circles. Marcy’s life is defined by her basketball playing, but she needs to get her grades up if she’s going to stay on the team. She reaches out to star student, Althea, for tutoring help, and as they spend more time together, a mutual affection begins to grow. It’s a simple story exquisitely told, with Blumenreich’s rich characterizations making it easy to connect with the young lovers and root for their romance. Marcy and Althea’s character design are total contrasts: Marcy has a tall lanky frame, light hair, and freckles while Althea is short and stout with dark hair, clear skin, and glasses. A subtle but substantial difference is in their hands. Marcy’s large hands are tied to her basketball playing but also heighten the expression of the character, and her animated hand movements distinguish her from Althea, who oftens her hands under her arms and gets nervous when she shyly waves to Marcy at a basketball game. Blumenreich does especially great work making small physical interactions feel important, emphasizing the role touch plays in projecting emotions that aren’t ready to be verbalized yet. The monochromatic pink coloring gives the book a soft, pleasant atmosphere, and the use of a bokeh lighting effect for a key moment dramatically enhances the romantic mood. Shivana Sookdeo’s lettering blends seamlessly with the artwork to reinforce the emotional content, like when she uses squiggly word balloon borders to show Marcy’s nerves when she’s revealing her feelings to Althea. Blumenreich gained a large online following thanks to her short Spider-Man fan comics taking a down-to-earth, deeply relatable approach to Peter Parker’s teenage superheroics. (You can read more about Blumenreich’s Spidey Zine in this Big Issues piece from last year.) Those comics put Blumenreich on Marvel Comics’ radar, but after drawing a back-up in Amazing Spider-Man #800 and a standalone issue of Spider-Gwen, Blumenreich cut ties with the publisher over their partnership with arms manufacturer Northrop Grumman for a promotional comic that was cancelled after outrage over the initial announcement. Blumenreich was slated to write a Big Hero 6 series for IDW, but eventually left that project after never-ending delays. She’s had lousy luck in corporate comics, but she’s realizing how much more lucrative it is to self-publish her own projects, recently tweeting that Full Court Crush has earned her more than double what she was paid for two issues of licensed-property series. As great as it would be to see Blumenreich expand her Spider-Man stories in an official teen Peter series, it’s far more satisfying to see her working on her own concepts, developing a confident, engaging creative voice that is supported by her ever-sharpening craft.